Before the list of illegal softball bats will be given, it is important to understand the role of the Amateur Softball Association (ASA). ASA is an organization devoted to professional and healthy softball playing. It is a non-profit company that trains and provides equipment national teams for competitions set worldwide. The ASA’s rules and certifications for both slow-pitch and fast pitch softball is needed to certify a player can participate competitions or play at official ball parks. A bat is legal or certified under specific regulations. This portion of this article will help identify the bats that can complete the ultimate softball experience. Softball bats must have ASA certification mark. This usually shows the 2004 mark. The 2013 mark is for slowpitch players only. The bat must be enlisted on the official approved bats models established by the ASA National Office. The bat must be evaluated to meet ASA standards by the umpire. (This rule is applicable to bats made before 2000 including wooden bats). These are the basic guidelines that will help you find out if the bat is legal. Remember, legal bats will allow a player to participate in any game and enjoy most ball parks. These bats are usually safer to use and considered the best types to help enthusiasts keep in shape. Being aware of common softball bats being sold but considered illegal because they do not pass ASA standards should be in mind whenever looking for bats. Worth EST9- a white bat with the word QUAD on it and drop of -9. Worth SBWK (Wicked)- a silver bat that says Wicked on it. Worth WWSC Wicked Comp. (SP Only)- a green bat that also has the Wicked label. Nokana Tomahawk- a black bat with its brand in fiery red. Miken MSU Ultra- a gray bat with the word Ultra. 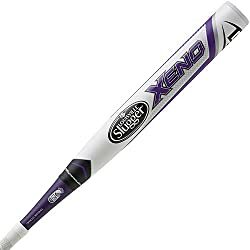 Louisville Slugger SB73V TPS Voltage- a red ended bat. Louisville Slugger SB34 Genesis- a red and black softball bat. Louisville Slugger FPC305 Catalyst (-8)- a bat with a yellow end. Easton SCX2 Synergy- a black and white bat. Bass Quake- a bat with an end that states Quake. Worth QESTFP- a bat with a blue end. Worth XGold- a white bat with a gold end. Louisville Slugger FP1369- a white bat with a blue design. Miken MSU2 Ultra II- has a darker design of the Miken MSU Ultra. Louisville Slugger SB304- a blue bat with TPS indicated. Although these softball bats look cool they would not be allowed for competitions and a number of ball parks or stadiums. There are also some other popular softball bat certification organizations that allow credible bats and pass most ball park regulations. The United States Specialty Sports Association (USSSA) certifies bats and softball equipment in order to align its mission in becoming the best sports organization. Since June 2015, no bats certified by USSSA have been withdrawn and non-complaint. USSSA allows bats that are wooden, metal, or composite. They require players to know if a bat is altered or not. The Independent Softball Association (ISA) has the similar functions and brand themselves for 21st century softball. It believes in strict banning of altered bats. Those who do not turn in altered bats may be banned for life. Those who turn them may be suspended from this professional sport for five years. The International Softball Federation (ISF) is also a recognized bat certification organization. Its guide on softball bat banning is very helpful with determining illegal softball bats. It stresses that altered bats are bats that the handle is replaced with other types of handles, bats with inserted materials, bats with more than two layers of tape, and painting the bat for non-identification purposes. These organizations are other valuable sources that will help players get bats needed to participate in more games. They are recognized by more experienced athletes and have helped them enjoy softball to its maximum. A player can only have these benefits, if he can truly identify if a bat is qualified for all his softball joys. This article has just provided the best information on softball bats. This information is reliable and handy for any slowpitch or fastpitch softball player. It would be best to explore this site to find out more information on softball. Everything all athletes can find out the buying guide to choose the best softball bats . Is a miken ultra 750X max load legal?